This work is recorded as BH 57. Acquired by Margaret Gardiner direct from the sculptor, and by descent. W. Gibson, Barbara Hepworth, London, 1946, p. 6, pl. 21. H. Read, Barbara Hepworth, Carvings and Drawings, London, 1952, pl. 33b. J.P. Hodin, Barbara Hepworth, London, 1961, pp. 19, 163, no. 57, illustrated. C. Harrison, English Art and Modernism 1900-1939, New Haven, 1994, p. 267. S. Festing, Barbara Hepworth: A Life in Forms, London, 1995, pl. 2. Exhibition catalogue, A Retrospective, Liverpool, Tate Gallery, 1994, pp. 43, 47, 50, illustrated. D. Thistlewood (ed. ), Barbara Hepworth Reconsidered, Liverpool, 1996, pp. 48, 65, 166, pl. 9. Exhibition catalogue, Barbara Hepworth, Valencia, Institut Valencia d'Art Modern, 2004, p. 36, illustrated. A. Wagner, Mother Stone: The Vitality of Modern British Sculpture, Yale, 2006, p. 164, pl. 138. Probably, London, Chesterfield House, 34 Gallery, April - May 1934, no. 28, as 'Whitehills'. London, Tate Gallery, Barbara Hepworth, April - May 1968, no. 21. Liverpool, Tate Gallery, A Retrospective, September - December 1994, no. 16: this exhibition travelled to New Haven, Yale Centre for British Art, February - April 1995; Toronto, Art Gallery of Ontario, May - August 1995. Chichester, Pallant House Gallery, The Model Modern Art Gallery: Modern British Art in Miniature, August - October 1997, no. 28, as 'Whitehills'. Carved in 1934 Mother and child encapsulates one of the key themes of Hepworth's work and that year she gave birth to the triplets. It belongs to a small group of small-scale sculptures in which the mother and child, sometimes carved from the same piece of stone, stand as two separate entities. The collections of both the Tate and the Pier Art Centre, Stromness, hold examples of similar sculptures (fig. 1). In both of these the small child is balanced on the mother's knee while in the present work the child nestles at the mother's side. Ronald Alley comments, 'The most developed variations on the Mother and Child theme are, however, the delicate series of two-piece groups made in 1934 in which the smaller 'child' shape is poised on the mother's knee, or rests in a hollow formed by her embracing arms, or lies beside her on the same base. Despite their abstract qualities, these variations exemplify different manifestations of the mother-infant relationship, especially the protectiveness of the mother towards her offspring and the physical kinship between the two. 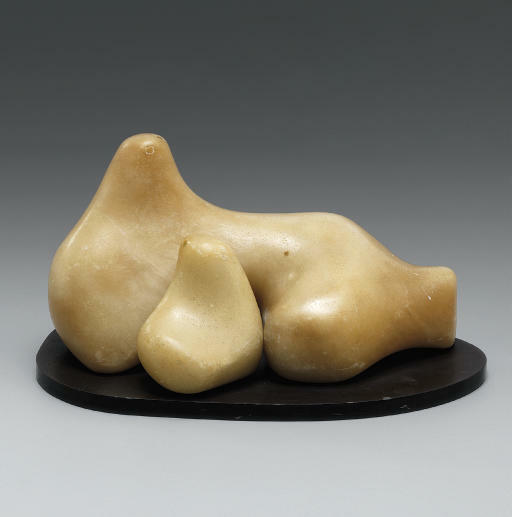 They are symbolic of motherhood in general and have something animal-like about them as well as human' (see Exhibition catalogue, Barbara Hepworth, London, Tate Gallery, 1968, p. 13). Margaret Gardiner (1904-2005) was a writer, an adopter of political causes, a founder of the ICA and a notable patron of the arts. From the 1930s onwards she built up a large and significant group of pictures and sculpture by artist-friends of hers including Barbara Hepworth, Naum Gabo, Terry Frost, Kenneth Armitage, Patrick Heron, Peter Lanyon, Roger Hilton, Alfred Wallis and Ben Nicholson among others. In the early days of their struggles for recognition she acquired these through purchase and later as gifts from the artists. She fell in love with Orkney during a visit in the 1950s and she bought a small croft on the island of Rousay which she continued to visit well into her nineties. In 1978 she donated her by then highly valuable art collection of mainly St Ives and Cornish art to the people of Orkney in return for all the pleasure of time spent on Rousay. It is now assembled and on view to the public in two 18th Century buildings at the Pier Art Centre, Stromness, which opened in July 1979. We are very grateful to Dr Sophie Bowness for her asssitance in preparing this catalogue entry. PROPERTY FROM THE COLLECTION OF MARGARET GARDINER, O.B.E.